An urban flood advisory was cancelled for early east central Miami-Dade County. The cities that had been under the advisory were South Miami, Kendall and Coral Gables. After Tuesday’s break in the rain, more wet weather was expected Wednesday as morning showers will likely give way to afternoon thunderstorms. Locally heavy downpours will be the main threat with Wednesday’s storms, as well as lightning and gusty winds with the strongest cells. Temperatures will reach 87 and it'll stay warm and muggy into the evening with lows around 75. Showers and storms will remain possible Thursday before the wet weather tapers off late in the week. Expect partly sunny conditions with isolated thunderstorms and highs around 88. 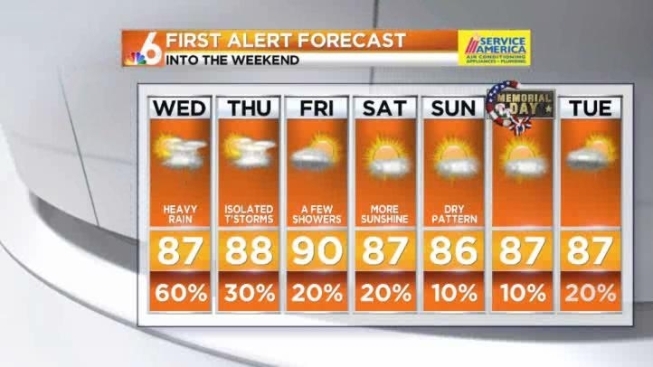 The Memorial Day weekend forecast looks mainly dry with hot sunshine and highs in the upper 80s.